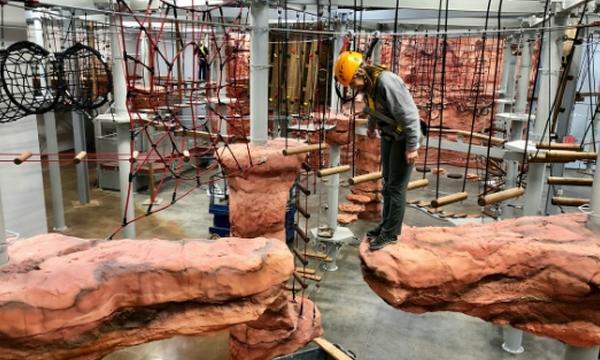 A 16,550 square foot, state-of-the-art, multi-level indoor ropes adventure park! Exclusively for CertifiKID Subscribers: A One-Hour "Try It" Pass! Summit Ropes has a Kids Course (ages 4 -6) and the Main Course (ages 7+). The courses are designed to accommodate a range of physical and skill levels. No experience necessary! Expect a challenge for the mind and body! You'll quickly learn how to use the smart belay to maneuver through multiple sections of ropes course elements, an 86-foot via ferrata rock wall, and exciting vertical challenges. With more than 120 suspended obstacles, no two experiences will ever be the same! What if I don't want to climb? While we think you'll want to "Try It" yourself, there's plenty of comfy seating on the second floor mezzanine, where you can also get an up-close view of friends and family working their way through the course! Summit Ropes offers complimentary WiFi, coffee, lockers and even flavored still and sparkling water to keep all of us happy as well. "Try It" Pass is valid for 1 hour of climbing. Closed-toe shoes required. Sneakers or hiking shoes recommended. See the Summit Ropes FAQ for more information and answers to all of your questions. NOTE: Only one pass at a time can be used when booking online so if you purchase multiple passes, you will be required to do separate checkouts for each or call 855-5-SUMMIT to book. Select your course and choose the date and time you would like to visit. Enter your 9-digit CertifiKID Vendor Code in the Discount Code section at checkout. Important Note: Make sure to use the "TRYSL" code for Kids Course reservations and the "TRYZS" code for Main Course reservations. Don't forget to fill out your waiver online to save time when you arrive. Reminder: No payment will be required, because you will have already paid CertifiKID.